The CSJ Saints stand proudly with their winning banner and trophy. RUTLAND — Just one year after the program’s inception, members of the College of St. Joseph baseball team are national champions. 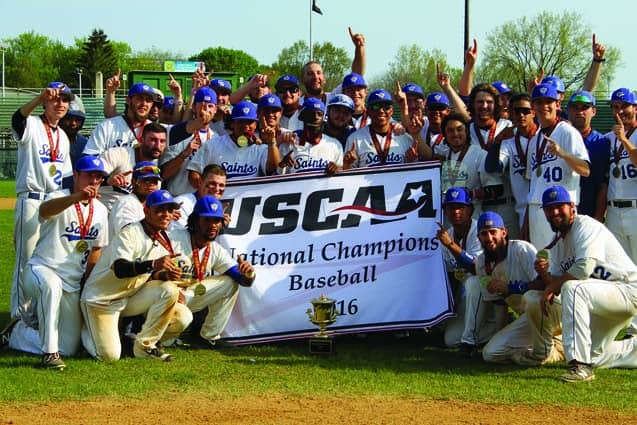 The Saints were awarded with the United States Collegiate Athletic Association national title after going undefeated in the series, including a 14-3 victory over Cincinnati – Clermont in the championship game Thursday, May 12. Senior Derek Osborne from Springfield, Vt., shut down Cincinnati – Clermont in the ninth to wrap up a complete-game win. Saints players rushed the field at the game’s conclusion, celebrating in a pile behind second base. A number of players emerged from the revelry covered in shaving cream. After that scene settled, Saints players got the jump on Coach Bob Godlewski and doused him with the water bucket. Derek Edge, Nestor Velazquez, Jordan Matos, Colin McLeod, Jared Morello, Kevin Rodriguez, and Connor Martin were all big contributors in the team’s championship win. The smiles and good news kept coming for the Fighting Saints as parents, family and fans snapped photos and video. Junior shortstop Nick Rodriguez, from New Britain, Conn., was named Tournament MVP. Alan Madsen, Tyler Kunzmann, Bill Brancatella, and Connor Martin were named to the All-Tournament Team. Seniors Nestor Velazquez, Justin Lemanski, Tyler Demers, Jordan Matos, Alan Madsen, Derek Osborne, and Bill Brancatella accepted the national championship trophy before joining their teammates and coaches to celebrate. The Saints finish the season 52-11 overall.